When I talk to my student leaders in our campus ministry, I tell them they have two jobs: show up and pay attention. It turns out I needed a little help with the latter. Not that I’m unaware of my surroundings. If anything, I’m hypersensitive to the conditions of mood and weather and comfort. It’s important for me to know the various aspects of the climate in which I live. Unfortunately, that commitment to knowing has made me at times hyper-focused on the politics that define so much of American life right now. And while conflict and disagreement don’t bother me–how else are we supposed to come to agreements if we can’t be honest?–the sheer idiocy of our time has cost me more than one gray hair. Even as we mark the death of John McCain, the conversation inevitably seems to turn away from the late senator and toward the president’s childish response to his passing. I’m continually baffled by the intellectual dishonesty and spiritual cowardice that enable our commander in chief to make it all about himself. I get pretty worked up. Luckily, my friend Boyd knows this about me. Boyd was also my son Zachary’s confirmation mentor. They occasionally met in our treehouse. Boyd is the kind of old man I’ll aspire to be, if I live long enough. Determined, curious, sometimes irreverent but always caring, Boyd has lived many lives in his nearly nine decades. He’s been a pastor, an author, a district superintendent–a job he still sees as inflated, if not ludicrous–a maintenance worker, a professor, and a self-appointed security officer. When Boyd makes his security walks around campus, he stops in at various departments, doing covert pastoral checks on his often wayward flock. A couple of weeks ago, he came by the campus ministry office to talk about an idea he’d first mentioned to me in an e-mail. It’s a great question, and one Boyd has the pedigree to ask. Aside from his life experience, he is a careful observer of politics. He’s also a New Testament scholar, having taught Life and Letters of Paul at Dakota Wesleyan for several years. He knows of what he speaks. And like many great teachers, he makes his point in the form of a question. When I go to answer it, I can’t help but feel a bit chastised. History is filled with Neros and Trumps, men of great influence but weak character who loom over everyday life. They crave power, and they derive it from attention. The more we talk about them–even in opposition–the more we play into their hands. For Paul, however, the emperor was barely worthy of mention. He could cause problems, of course. In fact, he could and did inflict real suffering. But in Paul’s perspective, he was nothing but an annoyance, a fly buzzing across the field of vision, a minor distraction from the real scene before us. For Paul and for Boyd, that larger scene is Jesus–his life and death, his teaching and his disciples. The spectacle of resurrection and the God-infused life that followed are, in this view, the only things really worth talking about. I’ve taken Boyd’s observation to heart lately. I spend less time reading the news–a healthy lifestyle change for any political junkie–and more time on the positives around me. And when I get caught off guard by the president’s latest atrocity, I remember Boyd’s question and shoo him away with the disinterest he deserves. I’ve got bigger things to focus on, and I’m happier for it. I’m late getting this week’s Monday’s Penny to press, and for a frustrating reason. Turns out that, despite my best efforts, I am blind to the obvious. My problem arose when I tried to connect to the internet at work this morning. The login screen wouldn’t take my password, no matter how many names I called it. I finally broke down and marched my computer over to the campus help desk. She pointed to a small box near the bottom of the login page. An adjustment by the IT department had resulted in a change in the settings. Once she clicked the box, I was up and running. It took maybe 20 seconds for her to fix it. 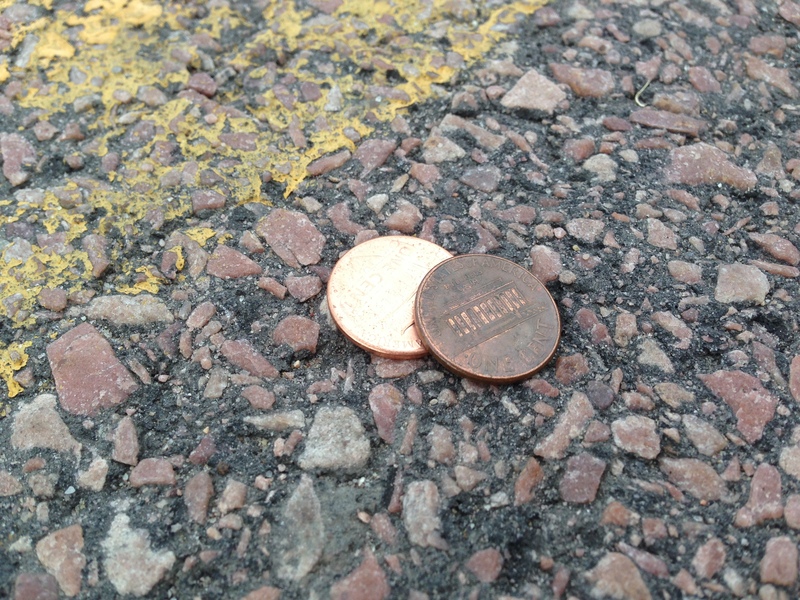 I always try to see the pennies, because they are the easiest to ignore. The thing is that I had noticed that small box when I first tried to login this morning. That’s odd, I thought. I don’t remember that being there. If I had stayed with that feeling a bit longer, I would have found and fixed the problem myself. But I didn’t. I kept trying my login information, hoping that the tiny data gnomes within my computer would finally step aside and let me through. I ignored my intuition. I didn’t look closely enough. These past several days, I’ve thought a lot about the discipline of seeing. Not the passive reception of visual stimuli, the typical practice for watching TV or driving a familiar route. I’m talking about the active effort to take in the world, to internalize it and make sense of it. And figure out what to do with it. At church on Sunday, we heard from several people in the Dakota Wesleyan family who had a deep lesson in seeing this summer. The team went to Uganda and Rwanda as part of a service trip organized through the McGovern Center. They spoke some about what they did, but mostly about who they met and what they learned. That’s not at all surprising. One of the key aspects of all such trips is to yank us out of our normal routine so that we see the world–and more importantly, the people in the world–through a completely different lens. Africa, in this instance, becomes not just a shape on a map, but a real place in which real friends wait to hear from us. That changes our perspective dramatically. But if seeing the world differently is a natural part of leaving home for awhile, incorporating the habit of perspective back into our daily routines is a much more difficult process. We are so used to seeing the world as we’ve known it that our brain takes shortcuts in processing it. We get back to the business of our lives and stop seeing the pennies in the parking lot. Or the unchecked box at the bottom of the login screen. Or the people right in front of us. This weekend and again this morning, I’ve been reminded how important it is to stay alert to the things–and to the people–that are the easiest to overlook. I’m reminded to look again, because the smallest things can be either the gateway or the barrier to getting connected.